We sometimes hear developers or product managers say – “tips” are a sign your UI has failed. But Google, with the biggest B2C interactive audience (if you include search) globally, use tips and modals very creatively. So the logical conclusion is that “Progressive On-boarding” is an initiative across many Google products, and it is successfully driving deeper engagement. Otherwise, they wouldn’t do it, right? So let’s examine a few of the tips, tours, modals that Google has used in their mobile products in the last 6 months. 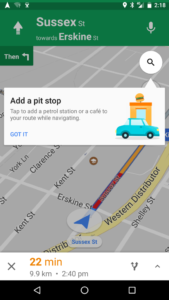 The Opportunity: Google recently introduced en-route destinations but I bet you didn’t know. They used a tip to promote the new feature. They did it the right way. The wrong way is more of a 2015 style “dumb” approach used by most Apps – throwing up a “What’s New” carousel for existing users when they open the App. This blocks the user from the utility that Maps exist to provide. Dumb. 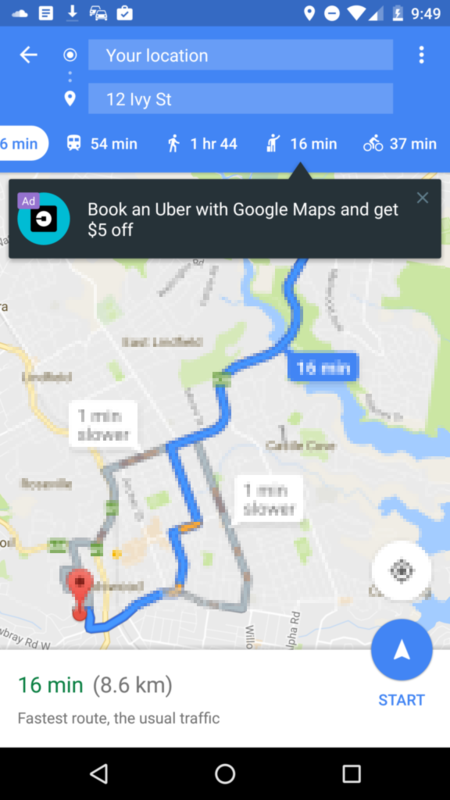 Context: Google keeps out of the way and lets you set your primary destination – this is Map’s main navigation use-case. So they don’t interfere with that. But after the trip is underway, this tip was shown. On this day we had a passenger to be dropped off at a train station, so we added this to our route and the default route was changed to support this. Smart! Wow Factor: by being contextual and delivering enhanced utility it is now burned into my brain that is a normal method of using Maps in navigation mode. So we know tips are great for education, but also tips can be contextual delivery methods for offers. We’ve seen a few media Apps introduce offers in the context of the UX – it’s a light-weight context-based approach, that does not consume developer resources or steal from screen real-estate to drive an upsell. I’ve got more Maps examples for another time…. We’ve already shown how Netflix encourages off-line viewing of videos. This is obviously a method for increasing consumption and usage of their service. 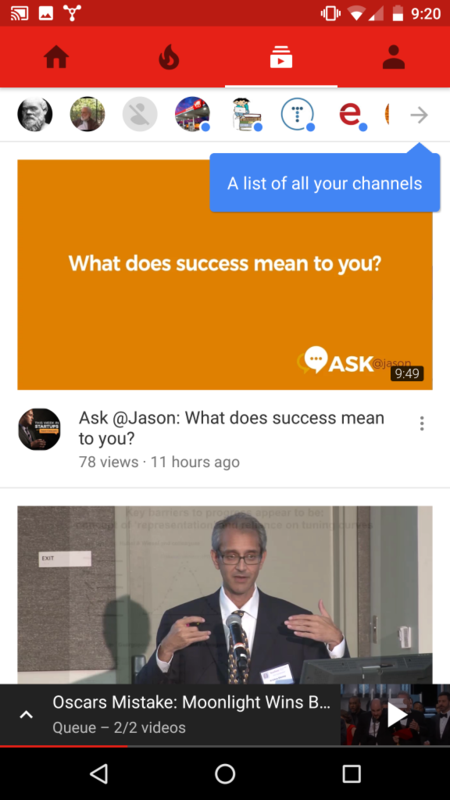 Here we see 2 Youtube variants: top and bottom – one with a bold title. We also see some of the buttons are changing, so it’s possible they can A/B alter the App render on-the-fly. So this is a good lesson that Youtube is trying different variants to see what creates conversion – after seeing these I started to download audio books over the home wifi to listen to while commuting. This tip is on the subscriptions Youtube page. “Channels” are your fave subscriptions. But Youtube recommendation engine overwhelms you and you never get back to your favorite content. It just gets lost. 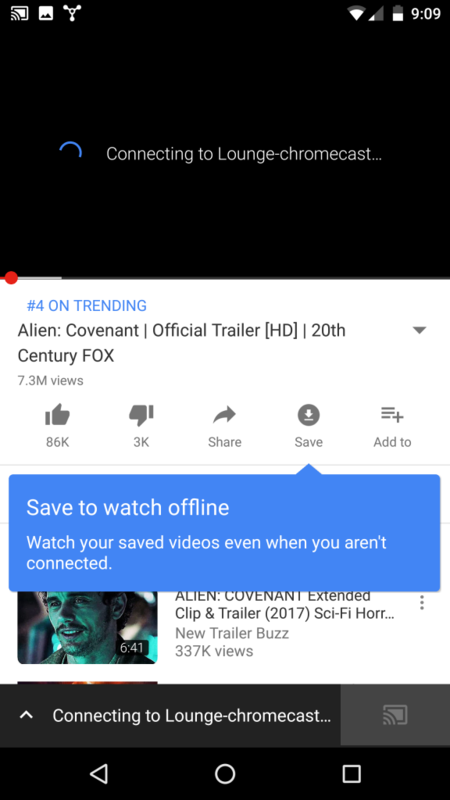 This simple tip reminds me I can see all my channels and skip the recommendation engine that is taking 90% of the screen. 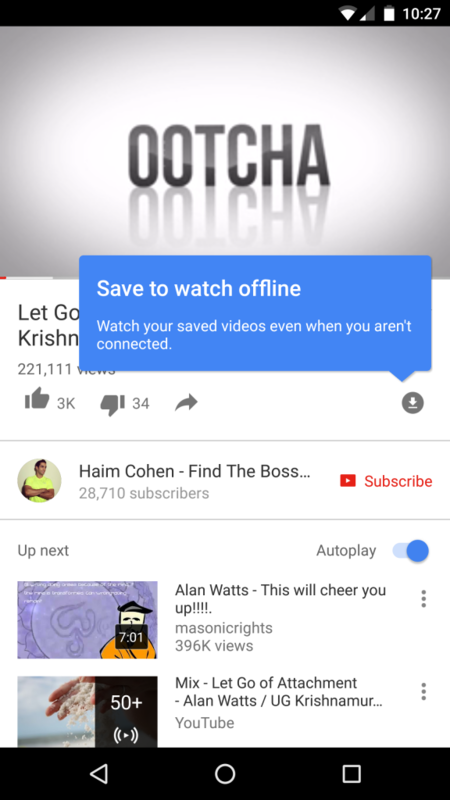 This tip is an example of a great reminder how App features get buried and you need to help user re-discover them. This suite of products has a lot of utility and designed for everyone from the casual user to displacing MS-Word and Excel in the workplace. Originally I was intended to include examples in this post but its way too meaty that I’ll devote a later post to it. This is an important initiative by Google to tough it out in the battle for IoT in your home. Google Chromecast became Google Cast and attacks Apple TV and AirPlay which had significant start and usability advantage. But the big game will be more devices under your control like Nest, Amazon’s range of Alexa devices and a raft of smaller sensors and controllers like LIFX lights. In the example, Home is showing a more directed initial onboarding experience. The goal is to get you to Wow! AND THAT IS YouTube or Netflix on your telly. 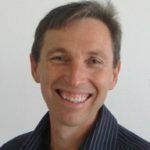 David is a serial founder and CEO. His companies include surfcontrol email filter, ThreatMetrix, StreetHawk and Pointzi.